Haven't been in a kayak yet? You are missing a fabulous experience. Northern Michigan has so many varied settings for kayaking. River kayaking lets the current carry you through wooded settings. Our many inland lakes can provide anything from calm and serene to wild and rolling depending on the day. And then there is kayaking on Lake Michigan. What an experience it is to quietly move across the water. Kayaking is becoming extremely popular and with good reason. It is not complicated to learn, and is very affordable. Kayaks of varying styles and versatility help make the kayaking experience enjoyable. Each summer in Northern Michigan, more and more kayaks can be seen on tops of cars as they head to the waterfront. The communities of Northern Michigan have embraced this sport. 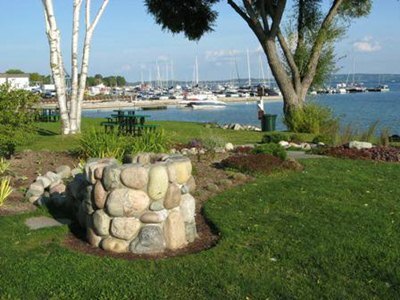 Harbor Springs, for example, has a kayaking launching dock at Josephine Ford Park. Kayak rentals are available that let families try the sport. A two-person kayak is perfect for exploring the beaches. Pack a picnic and head out on the water in a kayak! In Petoskey, the Bear River Valley Whitewater Park has quickly become a premier destination in the Midwest for whitewater kayaking. Every August, the Coastal Crawl swims take place from Zorn Park beach to Harbor Point and back and volunteers in kayaks patrol the route of the swimmers to alert boaters to their presence. It is a glorious scene to see the harbor lined with kayaks. Walk the docks on Harbor Springs or Petoskey and you'll see kayakers gliding along the water enjoying another perfect day in Northern Michigan. Explore Hamlin Lake and surrounding waterways, starting from the State Park canoe and kayak trails. The moderately fast current, the clear water, and the low degree of stream bank development have all helped to make this river a mecca for those who canoe or kayak. Paddle the forks, estuary, and the head of Pentwater Lake on a canoe, kayak, or stand up paddle board. Hamlin Lake offers so many neat areas to explore on a canoe, kayak, or stand up paddle board, including upper Hamlin Lake and three different bayous.